This short two part blog series will highlight some tips on using PowerPoint 2010 to produce and deploy eLearning courses as well as showing a few examples. In this first part I'll highlight useful PowerPoint techniques when creating eLearning, while Part 2 focusses on how to get your courses online or onto your LMS. 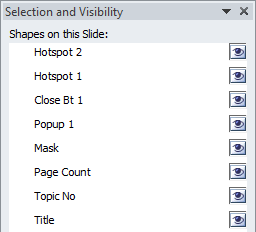 Animations and the Selection Pane Animations and the Selection Pane are the PowerPoint 2010 features I've used most when building eLearning courses. The key to using PowerPoint animations in eLearning is to master triggered animations. This way the user can interact with content in a non-linear way. The green buttons in this example use triggers to display extra information. On certain screens you'll want to have a number of interactions to make your eLearning more fun and interesting. This is when you will need the Selection Pane to manage all the objects you have onscreen. Every time you add a new object to a PowerPoint slide, a layer is created for that object. The Selection Pane let's you view all the object layers in a simple list view, making it easy to select and move them around. PowerPoint gives each layer a default name e.g.TextBox 1. Top tip here is to always rename your layers to something a bit more meaningful - for your own sanity and so others can edit your work. Once you've mastered animations and how to trigger them at the right time it's really just down to coming up with ideas on how you can leverage this functionality to create the interactions you want. Below are some recent examples from courses we've created. These we're all created in PowerPoint then published via a third party PowerPoint plugin called iSpring.